This miniature dollhouse trunk kit is a lithographed wooden done in a Around the World motif. The trunk kit is wooden, 1:12 scale and the truck opens and is newsprint lined on the inside as well. This Lithograph Wooden Trunk Kit - Around the World scene on it is a nice touch for any room in your dollhouse. 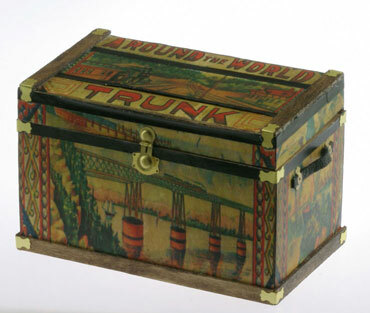 Approximate size of the Lithograph Wooden Trunk Kit - Around the World themed, once assembled is 3" long by 2" deep by 2.5" tall and the kit includes instructions, wood, litho printed paper and hardware. This Lithograph Wooden Trunk Kit - Around the World is supplied by Handley House Miniatures, which generally ships within 8 business day(s) of you placing your order .